The scariest non-horror movie ever! 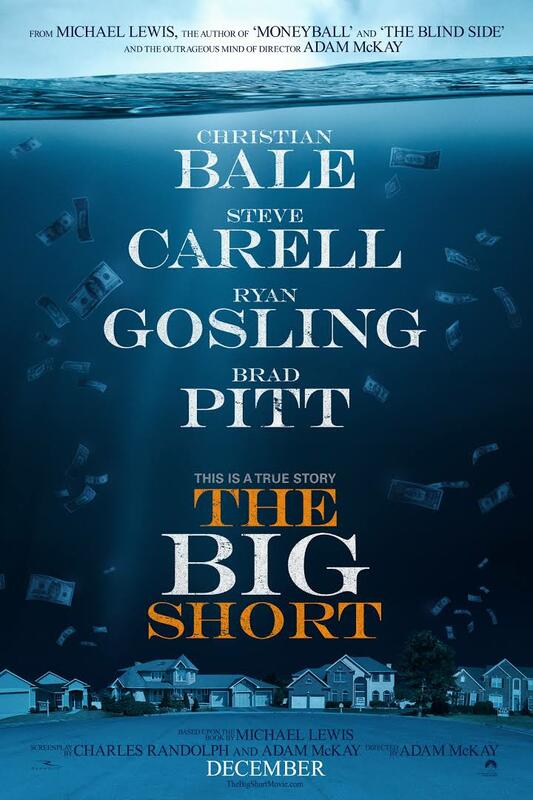 Paramount Pictures’ The Big Short, based on the best selling novel by Michael Lewis, is the star-studded film that meticulously recreates the course of events that led to the worst financial crisis to hit the United States, and by extension the world, since the Great Depression. It isn’t often that when I leave a movie that I instantly feel like I need to watch it again, but this is definitely one of them! Furthermore, this is a fantastic film to show any business or financial class on the graduate level. Brilliantly casted and directed, this film will have your utmost attention the entire time. In fact, when it’s over, you will most likely want it to go on. Screenwriters Adam McKay (also the director) and Charles Randolph create a movie with such realism and candor that you will be able to truly understand the foundational problems that aided in creating the mortgage-backed security crisis which led to the housing meltdown and the loss of millions of jobs. The scariest part is, at the end of the movie, you will read that starting in 2015 that big banks are once again engaging in similar behaviors under a new name. The utter greed, absurdity, and naivety on display in this movie will leave you astounded. The Bg Short is a biographical documentary-like drama that goes behind the headlines and years before the height of the financial crisis (now referred to as the Great Recession) and reveals the actions of big banks and front-line mortgage officers alike that contributed and eventually causes the housing meltdown. After one major hedge fund investor discovers that the big banks are buying up and selling bad mortgages, he takes actions that create a ripple effect amongst a small group of hedge fund financial investors that begin to sound the alarm that big banks refused to listen and believe. Against the odds, this small group of investors attempt to warn the big banks that the US financial system, and by extension the world, is in grave danger. This film follows several key players in this movement and sheds light on what was really happening behind closed doors. If you want to gain a better understanding of what caused the housing meltdown and financial crisis, then plan to see this movie. Or, if you are just looking for a fantastic movie with suspense, mystery, and action, then plant see this movie. It is of no surprise as to how this movie has received Oscar nominations. The phenomenal cast brought these recent historical figures to life in only a way that a cinematic story can do. Full of intellectual action, this movie successfully delivers a powerful message with a brilliant story. Many times, the best stories are true ones, and it doesn’t really get any truer or more visceral than this one. Not often can a movie capture a historic series of events with such accuracy whilst delivering a cinematic experience. More than a documentary, this film possesses a brilliant approach to the visual storytelling of a real modern-day crisis that isn’t that far removed from today. The combination of mostly an objective perspective with a healthy helping of subjective points-of-view makes this a unique experience. Watching this movie, I couldn’t help but imagine that t almost plays out as something fabricated, made up for a gripping and dynamic plot; but the fact of the matter is that this really happened. Moreover, if the big banks continue in their ways and not learn from their mistakes, it could happen again. Although this is definitely a visually driven story, there are times that there is commentary or further information in the form of text or actors breaking the fourth wall. Ordinarily, I don’t typically like moves where the characters speak directly to the camera or audience, but the manner run which the asides were written into this movie worked extremely well. I will keep this review short because I definitely want to encourage people who want to gain a better understanding of the financial crisis to see this movie and experience it for themselves. You will definitely not be disappointed.